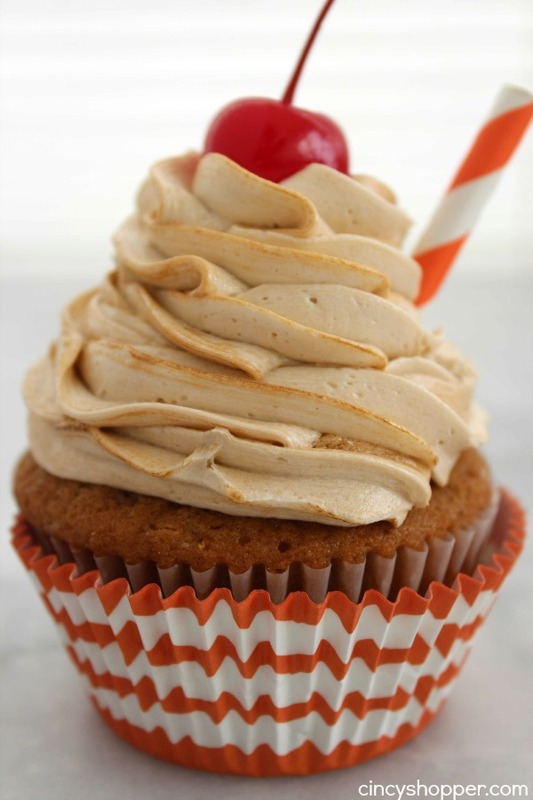 Here you have it… A tasty root beer float in cupcake form. Don’t these little cakes scream summer? I think they do and they will make for a great dessert at our summer bbqs this year. The hubby and I are big root beer float fans. If I had a dime for every time we have enjoyed a tall old fashioned style root beer float, I would be one wealthy woman, ha ha! Root beer floats bring back so many great memories for me. My grandfather would enjoy a root beer float at home quite often. Floats were one of his favorite evening desserts. I recall not being too fond of the flavors when I was very young but when I got a bit older, they became one of my favorite summer time treats. The vanilla ice cream combined with root beer is just perfect in a float so I thought to myself.. Why not in a cupcake? I am always on the hunt for cupcakes or cake that the hubby would enjoy. 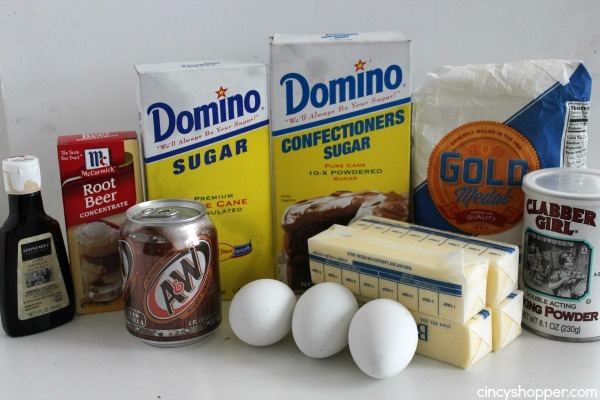 He is not a cake or cupcake person unless I make something different like our CopyCat Cracker Barrel Coca-Cola Cake. He loves root beer and he LOVED these cupcakes. In fact, he ate most of the batch I made. I did manage to score a few for our neighbors before he finished them off. 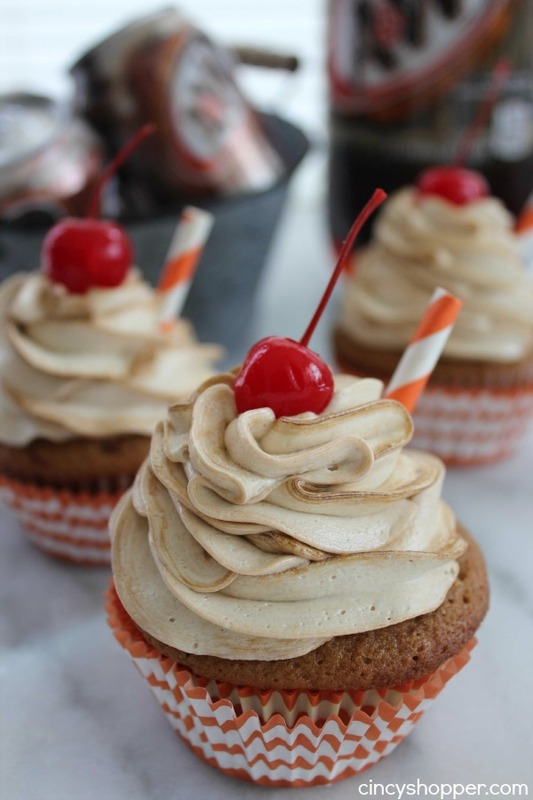 These root beer float cupcakes are moist and have a bit of the root beer flavor. I then topped them with a yummy root beer flavored buttercream frosting. They were a perfect combination of flavors, not overwhelming at all. 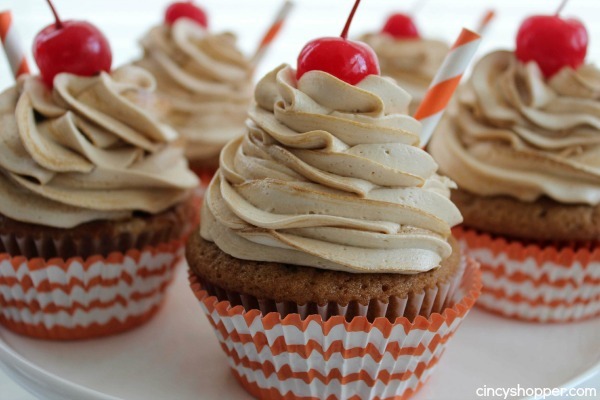 I made my root beer float cupcakes from scratch. They are very simple to toss together. You will have them in the oven baking in just a few minutes time. The only thing you may not have in your pantry is the root beer concentrate and the root beer soda. Are you a fan of root beer floats? 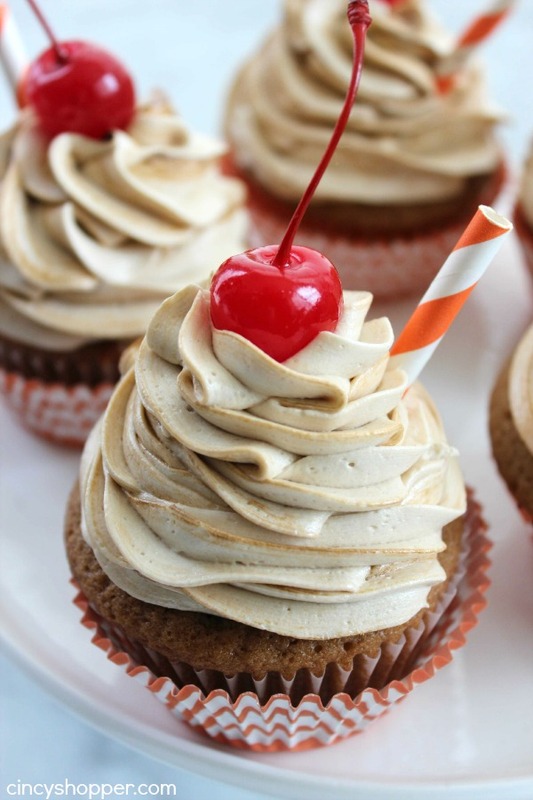 I just luv root beer floats so I know I’m going to luv these cupcakes!! This sounds delicious! Do you think the frosting would work with like a chocolate cake cupcake? Or is that weird? I’m just curious. I love cool flavored frostings that are totally unique. Hello! This is such a great recipe! I’m going to try it tomorrow! How many cupcakes does this recipe make? My frosting didn’t thicken up at all, and I even tried adding more powdered sugar. What did I do wrong? Don’t add all of the root beer soda at once, instead, add it a teaspoon at a time until you get a good consistency. These turned out really, real tasty tasty and perfect! Thanks so much! I found that the consistency of the icing wasn’t great for piping so not sure what I did incorrectly there, but it tasted okay. I would’ve liked to get that multicolor thing in the picture happening too, did I stir in the extract too well? Do you think this recipe can be made in round cake pans? And if so, what size do you think one batch would make? I absolutely adore these cupcakes, but, like several others here, my frosting was not a success. It was OK until I added the actual root beer soda. Then it turned runny and gloppy. Tasty, but ugly. Without the root beer, it didn’t have enough flavor. Please tell me how to fix this. These are adorable and look so delicious! 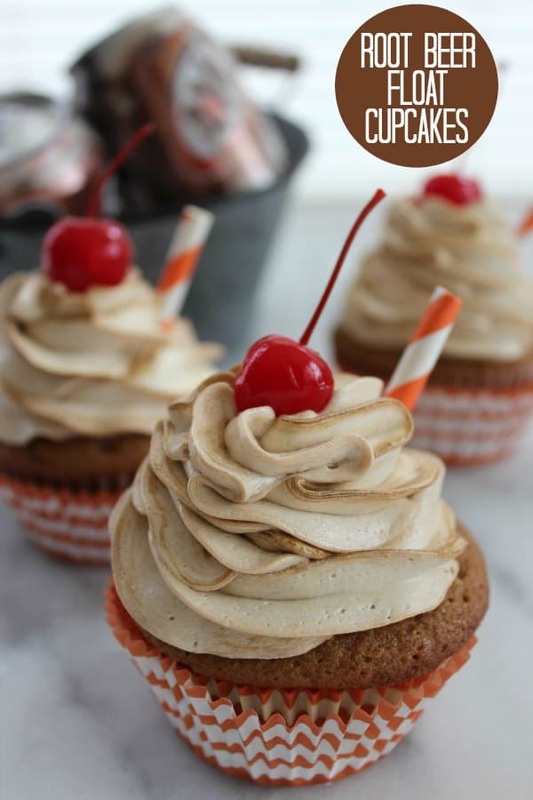 Root beer floats and cupcakes on their own are great much less together! Thanks for linking up with Delicious Dishes Recipe Party! I just made these as a trail run for a granddaughter for school. I don’t know if others sifted the powdered sugar or if they add all 3 Tbsp. Root beer at once. I actually used root beer concentrate and added extra to get more root beer flavor. I thought frosting was too sweet but not a big frosting person. Granddaughter loved them. I used sour candy cherries on top. I loved the cupcake without frosting too. For those who’s frosting would not hold together for piping you can always add more powdered sugar. I just keep tweaking it until I like how it holds up. 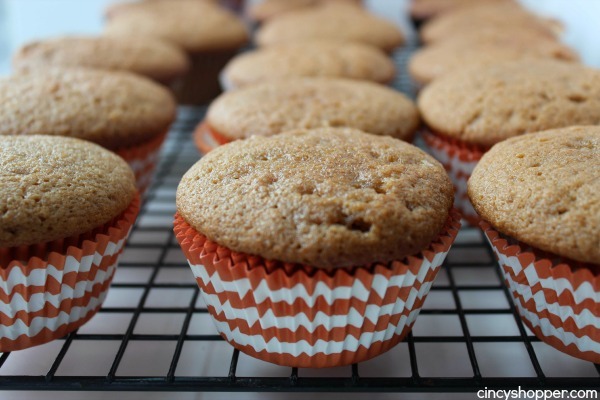 Thanks for the scratch cupcake recipe! 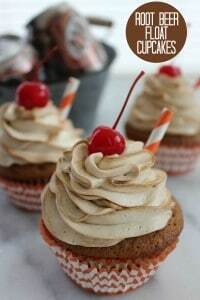 I made the Better Homes & Gardens recipe for Root Beer Float Cupcakes (from a mix) earlier this year & they were a hit, but I usually prefer scratch cupcakes. I placed root beer barrel hard candies on top of icing w/ a straw; looked cute. 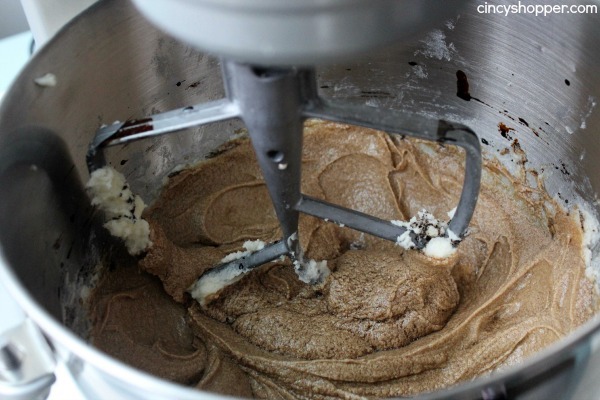 For my frosting, I made a browned butter frosting adding root beer concentrate and 3 oz. cream cheese…it was awesome. Can’t wait to make your cupcakes. I was planning to make these for my bridge group this Wednesday and am tickled I found your recipe! Correction to my post a few minutes ago. Recipe for Root Beer Float cupcakes I made prior was not a Better Homes & Gardens recipe, but a Midwest Living recipe. I found these made about 20 cupcakes filled to what I consider 2/3 full, but if you cut back a little, you could get 24. I added more root beer flavoring to the frosting. 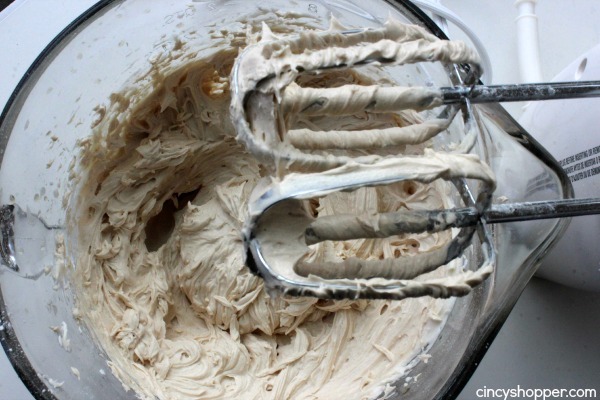 Make sure you use your whip attachment and whip the butter and flavorings first. Add your powdered sugar 1 cup at a time. 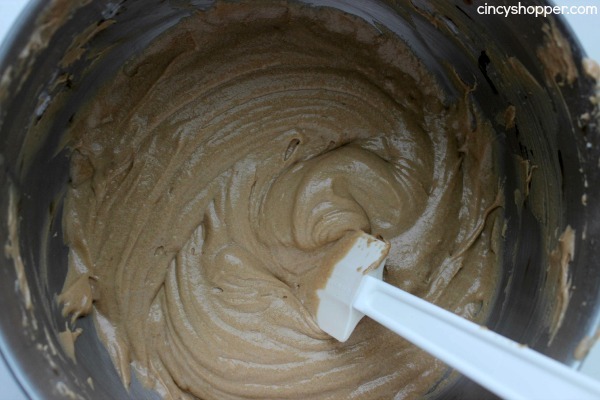 Once everything is blended, then slowly add the root beer soda, I didn’t measure, but added it in very small increments until the frosting became a pipeable texture. If you plan to pile it on like the pictures, double your batch. Came out very nice!